I just thought I was crazy. My wife, however, is convinced that I am. She says I am a bad influence on my children. And the reason is I play ‘Angry Birds’ on phone and computer regularly. She says it is not right to fight - for video game access - with one’s own children. So, I pointed out two news items from Daily Tribune newspaper’s consecutive editions of Jan 10 and Jan 11 to her; both related to ‘angry birds’. On this matter, I said to her, I am definitely not alone. Firstly, I pointed out that ‘facebook’ and ‘angry birds’ are the world’s most downloaded apps in 2011, according to Apple Inc. (DT, Jan 10). It is obvious that millions of people have downloaded the game applications. Secondly, I showed her Daily Tribune's cover page picture (DT, Jan 11) of the huge ‘angry bird’ structure made from piggy banks, in Taiwan. It is now the election symbol of Taiwan’s Democratic Progressive Party (DPP). That huge structure is outside the campaign office of the presidential candidate, Tsai Ing-wen. But when she was still not convinced, I showed her TIME magazine’s report that since the time Rovio launched this video game, as recently as December 2009, Angry Birds has been globally played for an estimated total of 200,000 years! And it still clocks in at 300 million minutes of play time daily! And my wife thinks I am the 'only' crazy one?? 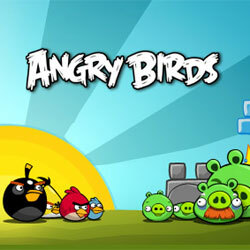 The PC Magazine too, in November 2011, announced that Angry Birds had surpassed 500 million downloads, making it the most downloaded game in the history of video gaming. Just imagine, 500 million downloads! Are there so many crazy people? As if the game download revenue is not enough, the Finnish company Rovio is making money on merchandising and selling the angry birds plush toys, t-shirts, mugs, posters and other paraphernalia for some time now. Apparently it has already shipped more than 10 million Angry Birds toys worldwide. And according to Business Insider, expected sales of 20 million in Christmas 2011. It is just because of these crazy people, I explained, that the global economy is running. But my wife still doesn’t believe me. But she said it is okay with her, and she will believe, if my children and I receive money from the company, Rovio, for playing the game. But, I said, are they crazy?